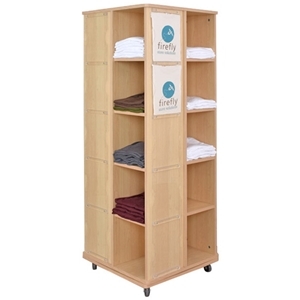 Our 4-sided, rotating t-shirt display is the perfect solution for neatly organizing t-shirts. Features a total of (20) shelves, (20) clear acrylic pockets and casters. Designed to allow customers to easily view the graphics printed on the merchandise folded on the shelves. Place this beautiful and functional fixture anywhere in your store!